frog cottage designs: Its finished!!!!! its been quite a while, but I can now tick this project off and start on my week old grandson Lachlan's quilt. 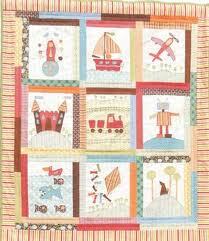 Its the cot quilt in Anni Downs "Its a Boys Story' book. Im in Sydney for a week before I go home. So Im sure I will have it finished !!!! Fingers crossed!!! I should get it done as IM not doing any Hexagons, nor my Pies and Tarts...... but the smiles on my grandsons faces ( and my daughters) will be worth the week or so away from my "Hexi addiction".